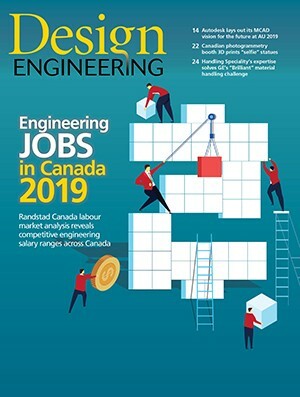 July 6, 2011 by Design Engineering Staff Expanded relationship to address growing Canadian demand for mechatronic simulation software. June 22, 2011 by Desgin Engineering staff Pratt & Whitney Canada PurePower line ushers in new era of quiet, fuel efficient aircraft engines. June 21, 2011 by Mike McLeod Seven-year agreement for Lockheed Martin C-130j Aircraft worth $70-million. June 20, 2011 by Design Engineering Staff Omega HHB1800 borescope features wireless probe. June 9, 2011 by Design Engineering Staff Undisclosed customer orders multi-satellite ground station for first quarter 2012. May 31, 2011 by Design Engineering Staff Laurentian University mechanical engineering students set world record at NASA’s lunar mining robotics contest. May 18, 2011 by Canadian Press Third largest aircraft maker predicts sustained growth for commercial jet business. April 29, 2011 by Canadian Press Iconic robot arm to retire with shuttle program. April 27, 2011 by Design Engineering Staff Projected $5 million satellite component deal to be carried out at company's Cambridge facility. April 5, 2011 by Canadian Press U.S. defence expert estimates F-35 cost will reach $148 million per jet.